Here at Tobacco Factory, we’ve always placed a strong emphasis on using local suppliers and working with small businesses – from our Sunday Market to the locally brewed beers we serve in the bar. When George Ferguson began the journey of the creation of the Tobacco Factory building, he created the ‘Strike a light for Independents’ project, inspired by the need to promote independent businesses in the face of the growth of chains. Food and drink is central to our businesses, and for a while we’ve been thinking about how we could have the most control over our supplies. We started to think about growing and rearing our own, and early in 2018 we purchased five acres of land near Backwell, south of Bristol, and are now well under way in establishing our farm – appropriately named ‘Five Acre Farm’. 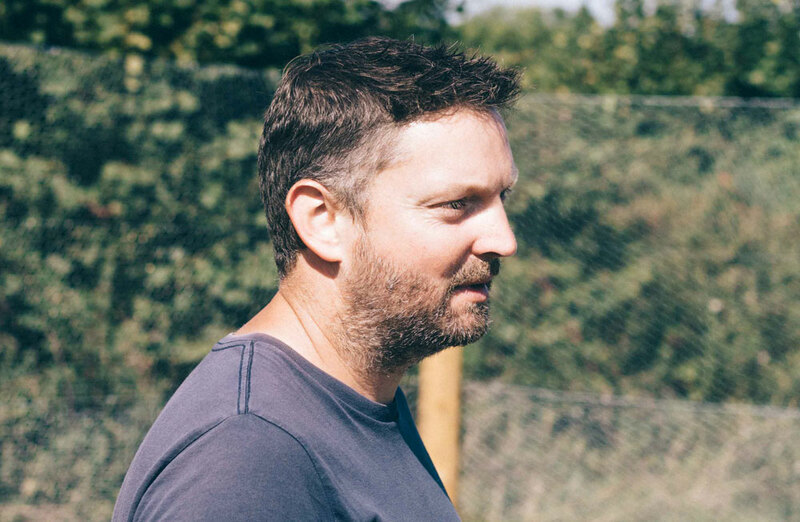 Jonathan Boundy – formerly the Café Bar Manager – had been enthusiastically growing his own vegetables on his allotment for some years, so was the perfect person from our team to take on running the farm. 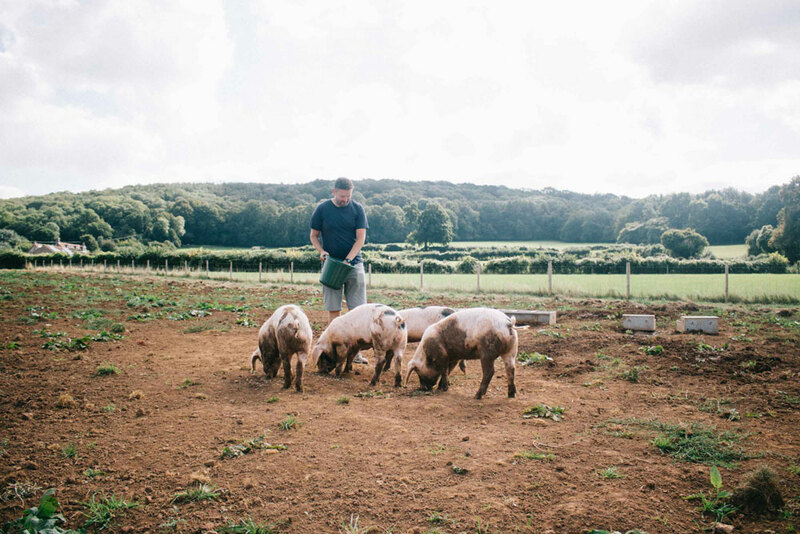 Our first crops have already come through and the livestock have taken up residence, with chickens of numerous breeds – from Speckled to Light Sussex – and Gloucester Old Spot pigs settled in. And we are producing our own honey straight from the beehives. Five Acre Farm produce is available on our stall at Tobacco Factory’s Sunday Market, along with produce from other local growers. Our vegetable range will be very extensive; we’re able to grow varieties with the most health benefits but which are hard to get hold of as they unsuitable for large scale farming. We’ll be growing tomatoes with the greatest amount of the lycopene nutrient, white beetroot, blue radish, purple cauliflower, asparagus, and carrots with a high amount of purple anthocyanins, and yes – they’re purple! We are growing and rearing with organic principles to make the best use of nature. 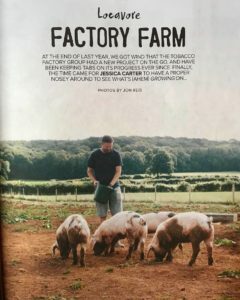 We are farming as sustainably as possible, for example by making use of the spent grain from sister company Bristol Beer Factory to help feed our pigs. Keeping the local emphasis for the farm we will employ people from the local area, helping to keep employment within the small towns and villages. 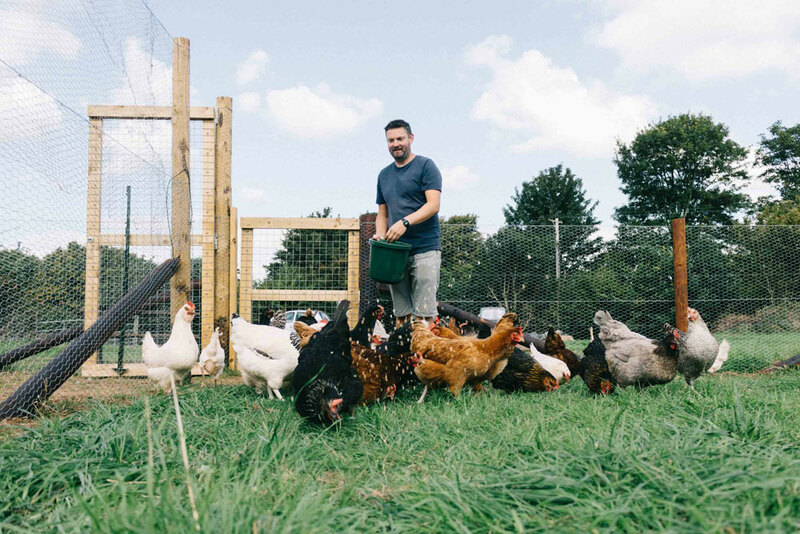 We will have several open days for people to come and visit the farm, to see and taste our produce and to meet our animals, and we’ll also be building a classroom barn so that schools and other local groups can spend time at the farm and engage with the project. Details of our open days and the classroom will follow, so keep an eye out on our Facebook page and website so we can keep you updated on our progress and why not follow the farm Instagram page too. As a teenager I enjoyed Gardeners World – although I didn’t do a lot of gardening. But then in 2005, before it was trendy, I decided to get an allotment. I remember pulling up my first leeks and the smell was nothing like you get from a leek in a supermarket. The leeks were just a start, I discovered so many different types of vegetables – from yellow courgettes and purple potatoes to tomatoes – from white to very dark purple. I was well and truly hooked when it comes to growing veg, and I’ve not stopped growing since. In 2016, having moved to my new allotment site in Ashton Vale, I installed a 25 foot polytunnel. I was amazed at how much I could grow, so many tomatoes and peppers, I just didn’t know what to do with them all so I was handing them to everyone, including many staff at the Tobacco Factory, where I managed the Café Bar, including the owner George, and Venue Manager Sarah. And that’s where the idea was sown for the Tobacco Factory and Grain Barge to have its own farm. Things moved fast, and an ideal site was purchased within a month of the discussion, in early 2018. Since then there’s been great excitement and a lot of digging as we get this new venture up together. This is an exciting new adventure for me, and I’m going to learn a lot – and so I hope will the customers. We will be inviting people to come and visit the farm to sample the produce and learn about how and why we grow our food, to grow seasonally with organic principles and with freshness you can’t beat. It will take two to three years to get fully up and running, for the blueberry bushes and the apple tress to establish themselves but in the meantime there will be plenty of vegetables as well as meat, eggs and honey from the farm for us all to enjoy.